Taikan Yokoyama was an important leader in the nihonga, or "Japanese traditional" school of modern Japanese art. In 1889, Yokoyama entered the Tokyo School of Fine Arts, where he studied with Hashimoto Gaho and formed an artistic alliance with two other artists who would also become leaders in nihonga, Shimomura Kanzan and Hishida Shunso. With them, he taught at the School; when its founder, Okakura Kakuzo, left the School after a battle with Japan's Ministry of Education, Yokoyama helped him found the Japan Fine Arts Academy. 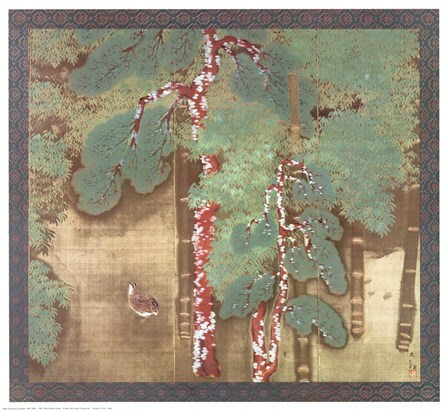 Yokoyama also held a teaching position in Kyoto, where he and Hishida studied Buddhist temple design; they also traveled together to Nara for the same purpose, and their joint trip to India inspired some of Yokoyama's most important work. In his painting, Yokoyama dispensed with traditional drawn outlines and created figures using pure blocks of color. He helped develop a style called-despite its striking use of light-morotai, or "muddled style," in which Yokoyama and other artists brought a Western emphasis on light and space to traditional Japanese subjects and techniques.